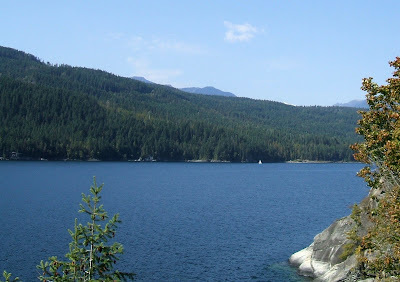 We Love RV'ing: Boating on Kootenay Bay, B.C. Boating on Kootenay Bay, B.C. In a quiet cove on the west side of Crawford Bay is the marina on Kootenay Lake, one of the spots in B.C. we love to RV. There are several sailboats moored and I can understand why they would choose this location. This is such a beautiful lake and one could have some wonderful trips just sailing on a sunny day, practically in their own back yard. I believe some of these would belong to sailors from surrounding communities as well. There are also several motor boats, some of which could be considered great RV for the lake, with all the comforts of home. Kootenay Lake has more boats in the summer time, but we’ve been here in other months and it is fairly quiet, just the occasional motorboat, fishing boat or sailboat. The lake is so large that it is not likely ever crowded. There are marina’s scattered all around the lake. We saw more on our trip up 3A to Creston, B.C., with access to boat launches at Boswell or Kuskanook or the ferry landing at the end of Kootenay Lake Rd. We often talk about how nice it would be to boat around the lake and enjoy the scenery from that perspective. Maybe one day……………..
breat pictures! The Kootenay area certainly is beautiful.